The most important thing you’ll ever learn in the martial arts..
.. that’s a pretty bold title I suppose, but it’s true. If there is one simple secret to success in the Martial Arts it’s this. I’m sure we’ve all heard the saying that goes: “A black belt is a white belt that never quit”.That’s a great way to summarise a major key to success in the martial arts. Perseverance. We all experience ups and downs in all aspects of our lives, and learning a new skill is no exception. To begin with, when you start training it’s all new and exciting, initially the reward you get far outweighs the effort you need to put in. After a while the initial excitement will settle down and you reach the stage where you realise that in order to progress you need to actually put some real work in to succeed. In these days where we’re conditioned for instant gratification that can be a challenge to say the least! Modern society has conditioned us, especially our children, to have an “I want it now” attitude. We are not willing to invest the time to achieve maximum results. Children are growing up with an entitlement mentality. I want it now, it is owed to me, everyone has one so I deserve one too. This is leading people into a dangerous future where they are simply not able to deal with challenges and the default answer is “I quit!”. 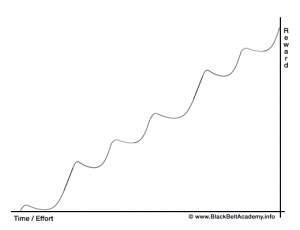 The real secret to mastery however is learning to recognise these dips and persevere, because when you push through the flat spot and come out the other side, the rewards are worth it. You’ll often find your ability, your confidence and your motivation take a huge surge forward. 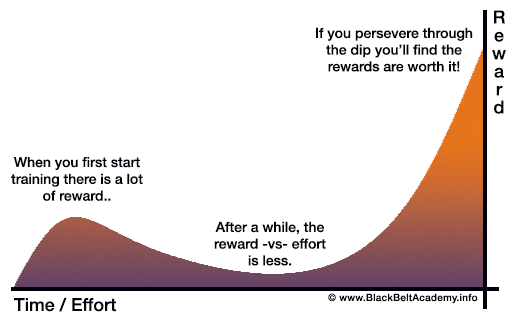 In addition to the obvious benefits to your martial arts training, by developing your perseverance like this you’re developing self-discipline which will benefit you in every area of your life..
It’s pretty much a certainty that every one of us will experience such a dip at some points, and it probably won’t be the only one, eventually you’ll find yourself facing another. The key then is to remember the lessons learned before, and use that experience to build the certainty that you can push through it, onwards and upwards to greater progress. This is one of the reasons it really helps to keep a journal to log your training progress, and to record the ‘magic moments’ that helped you through the challenges you’ve faced along the way. If you hit a challenge in the future, you can look back and remind yourself how you worked through it and the rewards you got for doing so. If you’re struggling to push yourself forward at times, remember that you’re not the first person to experience this! Talk to some of the senior students and I’m sure they’ll all be able to relate to how you feel. Just about all of the current black belts could give you examples of challenges, setbacks and ‘flat spots’ they’ve had in their own training. But they all share one common trait. They never gave up. They used that key black belt skill of perseverance and it helped shape them into the Black Belt they became. For example, use the Academy forum to discuss your training, keep a journal and share motivational tips with your fellow students. Parents – keep in touch, use our experience! We know that sometimes you’ll find it tough when your child goes through one of these natural dips, and of course they don’t yet understand the benefit of perseverance that we as adults can appreciate. It’s really important that we help them to learn this skill, and support and encourage them during those flat spots. It’s tricky sometimes to stick to your guns, especially when I child says “I don’t want to go tonight” or worse still “I don’t want to go any more!” but the key thing is to remember the reasons you enrolled them in the first place, think of the ‘big picture’ benefits that we can understand. After all, I’m sure they’ve said they don’t want to go to school a few times by now too, but we understand the benefits to be gained from a formal education. In the martial arts we add in the many benefits of some really valuable life skills and character development too. If you’re having a challenge with your child’s motivation, please let us know ASAP! Having taught literally hundreds of children over the years we can almost always help. My child wants to quit – now what? “A black belt is a white belt that never quit”. http://www.blackbeltacademy.info/wp/wp-content/uploads/2013/04/website-banner.png 0 0 admin http://www.blackbeltacademy.info/wp/wp-content/uploads/2013/04/website-banner.png admin2013-11-28 15:26:312018-05-02 18:50:17The most important thing you'll ever learn in the martial arts..